requirements) to function as a personal video recorder. I sent some patches about UPnP extentions to the project term based on MediaGateForCC from 2004. 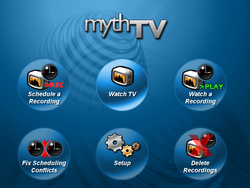 MythTV supported UPnP/AV media server based on MediaGateForCC from the release. Menus are now drawn by MythUI using OpenGL. This option can be enabled/disabled in the Appearance settings.